This week’s topic is in response to what has happened Baton Rouge, Saint Paul and Dallas. Until the August primary, the Home Page will ask the candidates running for the legislature a question per week, ranging across the board of issues facing Williamson County. All candidates were asked the question via email, with their responses in alphabetical order by district. How can we make sure that Tennessee law enforcement officers are careful in the use of deadly force, and how can we foster a better relationship between communities and police? First, I offer my thoughts and prayers for the Dallas victims, and their families, and we pray for our brave law enforcement officers who risk their lives to protect us. In order to maintain law an order, we depend on our law enforcement officials to perform at a high level. They are truly our communities finest. If we expect to foster a positive relationship between the community and our law enforcement officials, we should place a high priority on providing them with the finest training and the finest accommodations possible. The challenges that confront our community dictate that we make this a priority at the local, state and federal level of government. Law enforcement officers are in a uniquely difficult position: working to keep us all safe while often making a very quick decision on who could be a threat, all through the lens of the laws of the land and basic human rights. They are citizens with families just like us, and they do what they do because they are passionate about it — not because they are making a great living at it. In light of the events in Dallas and today in other cities around the nation, law enforcement cannot and will not respond with fear. Organized society is based on laws, and that means tough penalties for anyone who breaks the law — rogue officers included — after proper investigation and due process. I would hold up our Williamson County Sheriff’s Department and the Brentwood and Franklin police departments as examples of great agencies that do a wonderful job of not only policing, but also community relations. We should not assign the problems of other cities to our county. Heroes are not Hollywood hypocrites pretending to be somebody they are not, nor are they multimillionaire athletes playing games. Heroes place themselves at risk for the safety and security of others. These officers, their uniformed comrades, and their families know the sacrifices they make day after day to keep us safe and to keep our homes secure. May God bless them all. Let’s be honest, if white officers were not being spotlighted for using deadly force against blacks, this would be a non-issue. Examining statistical details may help separate emotion and rhetoric from known facts. Whites make up about 62 percent of the U.S. population while blacks make up about 13 percent of the population. In the most populous counties, however, blacks are involved in about 60 percent of robberies and murders. It therefore stands to reason that officers doing their jobs in these communities will disproportionally face armed and resistant suspects, increasing the chances that deadly force may be necessary. Statistics reveal that only 4 percent of black homicides were at the hands of police officers while 12 percent of white and Hispanic deaths were the result of police shootings – yet I’m certain that any “white lives matter” movement would immediately be called racist. Two other facts deserve mention. One is that police officers are over 18 times more likely to be killed by blacks than non-blacks. About 40 percent of cop killers are black. In addition, studies show that black and Hispanic police officers are over three times more likely than white officers to fire a weapon at a black suspect. I believe the heart of this problems lies deep within the black community – it lies with the near complete breakdown of an intact family structure and the lack of a father’s presence. Blacks must assess their situation and develop solutions that may best suit their needs. We can support these efforts through organizations like the Family Foundation that promotes fatherhood and the responsibilities that come with it. As a former law enforcement officer and member of a use of force review board, I can assure you that there is no shortage of use-of-force training. The decision to use deadly force typically occurs within a split second but that instant in time will be scrutinized for years and will never be erased from an officer’s conscience. Do police officers make mistakes? Of course they do – they are not perfect, infallible individuals. When they make mistakes or break the law themselves, they should certainly be held accountable. But these judgements should be made by our legal system and not by activist groups bent on sensationalizing terrible situations to the detriment of a discordant community. In light of the Dallas assassination of five Dallas police officers during a black lives matter demonstration, we must look at the facts. A police officer is 19 times more likely to be killed by a criminal compared to a non-armed citizen being killed by a police officer. Thus, the real question is: how do we protect our police officers? We have too many groups in this country interested in gaining political points and support by encouraging and waging a war on law enforcement. I think local governments must integrate our police officers into community meetings and events. Secondly, we as a society must shame those so-called “community leaders” who call police officers killers and racists. Our police officers put their lives on the line every single day protecting all citizens. For those officers that do break the law, they should be punished by the law, just like any citizen. It should be noted that in the face of snipers killing the officers in Dallas, the police officers did not flee, but defended the lives of the very people that were protesting them and calling them racists and killers. This is a true act of heroism and we should be doing all we can to support our law enforcement officials across the country. It’s imperative that we continue to fund training for our police force and make it a priority in the budget. I’d also like to see education courses on empathy training introduced as well as making body cameras mandatory. Body cameras protect the police from false accusations as well as the public, because then we all know exactly what transpires if and when questionable events occur. We’re very lucky in Williamson County to have strong leadership in our police department with the Chief of Police Deb Faulkner and Sheriff Jeff Long of the Sheriff’s Department. In fact, the community came together a couple of days ago to offer prayers and support for our men and women in uniform while also grieving for the lives lost in St. Paul, Baton Rouge and Dallas. Continual conversations and transparency between a community and their police force is imperative. Chief Anderson and the Metro Police department are also excellent examples of working with the community at large to keep an open dialog and deter violence when the atmosphere is tense. All in all, I’m proud of Tennessee’s law enforcement officers and will continue to support them as a State Representative. The increased use of body cameras on police officers is a step towards accountability. A local law enforcement leader recently told me it gives officers a sense of security, as well as citizens. Locally, we have thoughtful leaders — from law enforcement, elected officials, and the community at large. 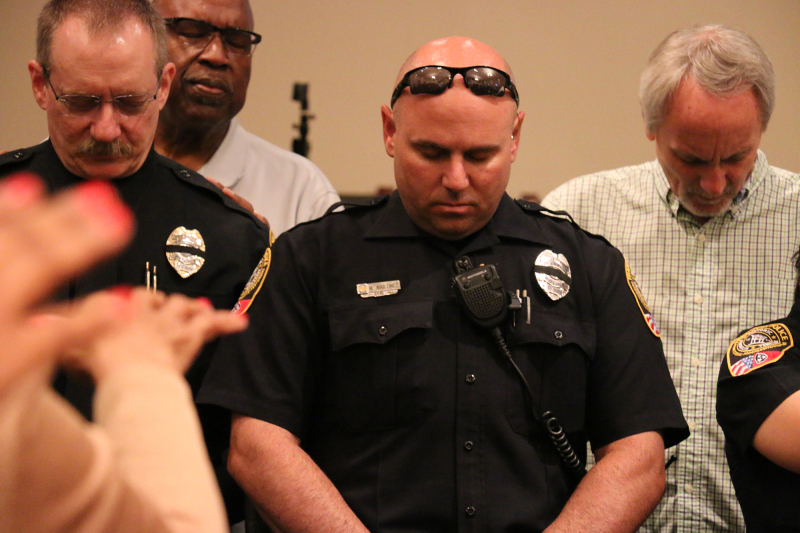 Saturday night’s ceremony at Limestone Baptist was an example of the type of proactive community meeting we should hold regularly for an exchange of ideas. Citizens and community leaders need to ride with our police or sheriff deputies during a Friday or Saturday night shift before they make any judgment regarding the professionalism, training and dedication of our law enforcement officers. I also encourage public participation in the citizen’s police academy programs offered by the Williamson County Sheriff’s Department and local police agencies to learn firsthand the challenges faced each day by the men and women of law enforcement. While attending MTSU, I worked part-time as a campus policeman to help fund my college education. I was awarded an A.A. in Law Enforcement and a B.S. in Criminal Justice Administration when I graduated in 1976. I served 26-years in the U.S. Army as a Military Police officer. I also served two years as foreman of our county’s grand jury. I have a long and lasting relationship with our law enforcement community and total admiration for all those who serve. I’ve supported them 100 percent before, during and will so after this election. We must never forget those brave officers who gave their lives for our safety and protection.